Rio Grande’s Joshua Anthony (4) defends the ball during Tuesday night’s 66-54 win over Point Park University in Pittsburgh, Pa.
PITTSBURGH, Pa. — After saving their collective post-season lives with a win last Saturday, the University of Rio Grande men’s basketball team moved one step closer to nailing down a tournament berth on Tuesday night. The RedStorm got double-double outings from Cameron Schreiter and Earl Russell and led from start to finish in a 66-54 River States Conference triumph over Point Park University at CCAC-Allegheny Gymnasium. Head coach Ken French’s squad, which improved to 11-17 overall and 5-10 in league play, can officially clinch a spot in the upcoming RSC Tournament with a win at home on Saturday against Carlow University. A win on Saturday, plus another Point Park loss, could actually end up giving Rio the No. 3 seed from the RSC East Division. Tuesday night’s win marked the first time the RedStorm recorded consecutive victories where the opposition scored 57 points or less since Dec. 30, 2012 (a 78-49 triumph over Cincinnati-Clermont) and Jan. 3, 2013 (a 73-57 win over Campbellsville). Rio Grande jumped out to a 9-2 lead over the Pioneers on Tuesday night before settling for a 30-28 lead at the intermission. 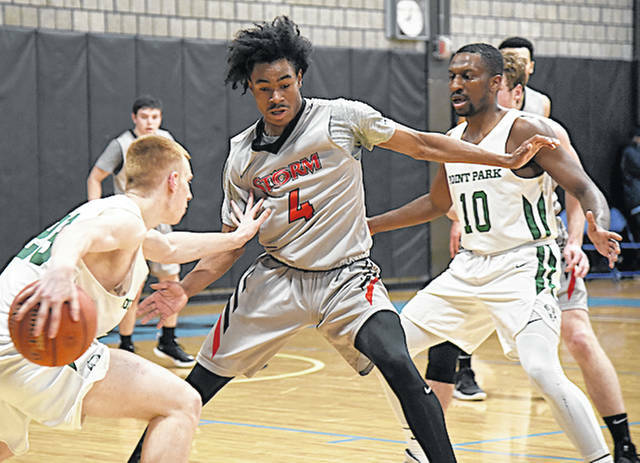 Point Park (8-14, 5-9 RSC), which had tied the game at 23-all in the first half, did the same again at 46-46 after a bucket by Mark Shehady with 9:18 left to play, but the RedStorm responded with a 9-0 run to grab a 55-46 advantage after a jumper in the lane by freshman Joshua Anthony (Newnan, GA) with 5:48 remaining in the contest. The Pioneers scored on their ensuing possession to draw within seven points, but got no closer the rest of the way. The game’s final margin of victory provided Rio’s largest lead of the night. Schreiter, a junior from Mason, Ohio, finished with a team-high 16 points in the winning effort. He also had 10 rebounds and a game-high three assists. Russell, a senior from Warrington, England, added 15 points and a game-high 11 rebounds for the RedStorm, while junior Hadith Tiggs (Mayfield Heights, OH) and sophomore Kyle Lamotte (Mason, OH) finished with 11 and 10 points, respectively. Lamotte tied Schreiter for game honors with three assists. Daniel King had a game-high 17 points in the loss for Point Park, which shot just 38.9 percent for the game (21-for-54). Kyle Carrington added 12 points for the Pioneers, who were also out rebounded, 47-22. Rio Grande’s Senior Day meeting with Carlow on Saturday is scheduled for a 3 p.m. tipoff.